Firefighters at Cathedrale Notre-Dame in Paris now believe they have brought a devastating fire under control. The vault of the French cathedral has collapsed, but local officials say that they believe the main bell towers and historic front of the building are now safe. The fire broke out shortly before 7pm local time, April 15. Multiple eyewitnesses shared photos and videos of the cathedral with visible plumes of smoke and flames across the cathedral’s roof. The historic spire of the cathedral, which stood 226 feet tall, fell shortly before 8pm. The entire cathedral roof was seen to collapse while the fire continued to burn unchecked within the main structure. Efforts by firefighters have been focused on the north belfry, with Paris' chief firefighter highlighting the risk to what remains of the structure if the main bell should fall through the tower. Shortly after 11pm, news service AFP reported that firefighters have said that they now believe Notre-Dame's main structure can be "saved and preserved." 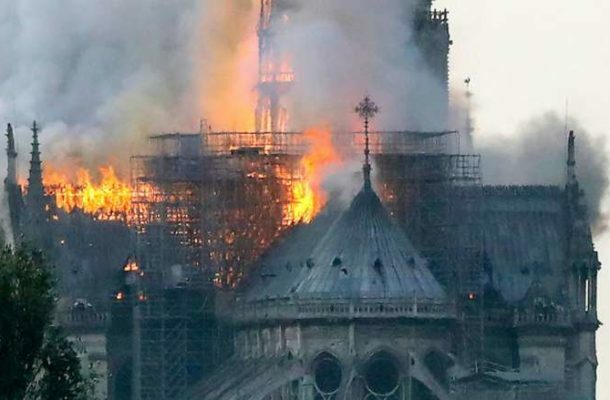 Archbishop Michel Aupetit of Paris said that "firefighters are still fighting to save the towers of Notre-Dame de Paris. The frame, the roof and the boom are consumed." "Pray," the archbishop told the priests of Paris, he also invited them to ring church bells as a public invitation to prayer. As flames spread, locals reported burning debris from the fire falling in the immediate vicinity of the cathedral. By 9pm the fire was contained within the cathedral building itself. Firefighters have cautioned that although the height of the flames appears has abated, the fire within the cathedral itself is not yet fully under control. Efforts were initially hampered by the height of the cathedral roof, which prevented emergency services from reaching the flames. "There is no word strong enough to express my sorrow," Hidalgo said. Outside the security cordon, Parisian Catholics have gathered in large crowds, kneeling to pray and singing devotional hymns to Our Lady. Officials have not yet determined what caused the fire, which is still burning. Both the fire department and the office of the public prosecutor in Paris have confirmed that investigations into the origin and cause of the fire have been opened. Marcon arrived at the scene of the fire at 9:20 pm, expressing his further shock at the damage as the fire continued to burn. Cardinal Daniel DiNardo, president of the U.S. bishops' conference released a statement on behalf of the American hierarchy calling the fire "horrific." "This particular cathedral is not only a majestic Church, it is also a world treasure. Noble in architecture and art, it has long been a symbol of the transcendent human spirit as well as our longing for God," DiNardo said. "Our hearts go out to the archbishop and the people of Paris, and we pray for all the people of France, entrusting all to the prayers and intercession of the Mother of God, especially the firefighters battling the fire."